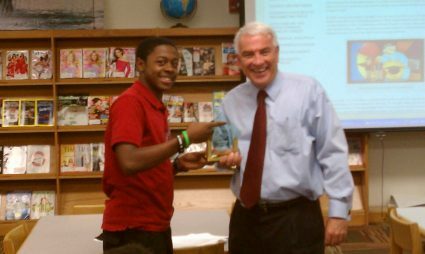 Net Literacy Vice Chairman Marvin Bailey was proclaimed a “Net Literacy Hero” by the nonprofit’s student board of directors. In 2005, Marvin Bailey was invited to serve as one of the first adult board members and help mentor the fledgling organization. Net Literacy is a digital inclusion nonprofit founded in 2003 by middle school students and whose board is 50% comprised of students. Immediately following Marvin Bailey’s election to the board of directors, the students increased the scope of the nonprofit and changed the name to Net Literacy, an organization that has now donated more than 20,000 computers, increased computer access to over 170,000 Hoosiers, and whose programs have been endorsed by two American Presidents. Last year, the FCC cited several of Net Literacy programs in the National Broadband Plan presented to Congress and this year, FCC Chairman Genachowski announced plans to launch a “digital literacy corps,” a suggested made by and credited to Net Literacy students in the National Broadband Plan. “Mr. Bailey,” said Net Literacy Student Chair and high school senior David Johnson, “is an advocate for youth empowerment and students maintaining ownership and responsibility for our all-volunteer nonprofit. As the only adult board member with nonprofit experience, he is our visionary and helped us understand how to mature and scale our organization.” Marvin Bailey currently serves as the Chairman of the TechPoint Foundation for Youth and was CEO of an education and technology training nonprofit for many years. “Mr. Bailey supported the concept of a youth-empower technology-oriented service learning nonprofit and as our Vice Chairman, is our coach, mentor, and cheerleader,” Johnson continued. Recently, Marvin Bailey joined Harrison College as the President of its Northwest Campus. “Because Mr. Bailey had always encouraged us teens to graduate from high school and attend college,” Johnson continued, “one of his first actions at Harrison was to provide all student volunteers a Harrison college scholarship.” Marvin Bailey also facilitated Harrison donating equipment to Net Literacy enabling us to build more than a dozen computer labs in churches and community centers, and in the works is a program where Harrison students will refurbish computers to assist Net Literacy with additional capacity to donate computers to schools and nonprofits.